This is a rare account of Babaji, who has retained his youthful form since the third century A.D., and of the immortal masters of southern India, the Siddhas, who initiated him into Kriya Yoga, a scientific art for realizing God, Truth and Self. It relates the inspiring story of Babaji's birth, childhood, quest for self-realization, transformation and mission in assisting humanity's "supramental evolution". The psychophysiology of Kriya Yoga and guidelines for its practice are clearly explained. Kriya Yoga can bring about one's physical, vital, mental, intellectual and spiritual development, and thus help increase health and happiness. 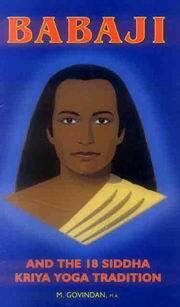 The first authoritative biography of Babaji, the immortal master made famous by Yogananda's "Autobiography of a Yogi", an all-time best seller. Babaji lives today near Badrinath, in the upper Himalayan mountains. His body has not aged since the age of sixteen, when centuries ago he attained the supreme state of enlightenment and divine transformation. This followed his initiation into the scientific art of Kriya Yoga by two deathless masters, the Siddhas Agastyar and Boganathar, who belonged to the "18 Siddha Tradition", famous among the Tamil speaking people of southern India. This rare account, by a longtime disciple, reveals their little known life stories, ancient culture and present mission, as well as how their Kriya Yoga can be used to bring about the integration of the material and spiritual dimensions of life. Clear explanations of the psychophysiological effects of Kriya Yoga and guidelines for its practice are given. It includes verses from the Siddhas' writings with commentary. A book which will inspire you. Marshall Govindan has practiced Babaji's Kriya Yoga intensively since 1969. In October 1999 he was blessed with the darshan of Babaji Nagaraj near his ashram in Badrinath, Himalayas. He is currently co-ordinating a team of scholars in a large scale research project encompassing the whole of literature related to the Yoga of the Tamil Siddhas. "An excellent contribution to the little known science of immortality." - C. Srinivasan, Ph.D., Professor Emeritus of Botany, Annamalai University, India. "It is the most accurate and comprehensive exposition of the ancient Kriya Yoga tradition and method published in English to date." - E. Ayyappan, longtime disciple of Babaji.